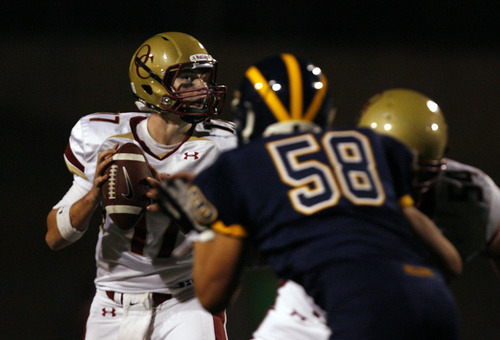 Scott Sommerdorf | The Salt Lake Tribune Oaks Christian QB Luke Falk looks out of the corner of his eye to see the rush coming against Bellevue (WA), Saturday, September 3, 2011. The Oaks Christian Lions lost 31-21 to the Bellevue (WA) Wolverines at the Mission Viejo Football Classic. Scott Sommerdorf | The Salt Lake Tribune Oaks Christian QB Luke Falk watches the defense play against the Bellevue (WA) Wolverines in the Mission Viejo Football Classic in Mission Viejo, California, Saturday, September 3, 2011. Oaks Christian lost 31-21. Scott Sommerdorf | The Salt Lake Tribune Luke Falk and the Oaks Christian (CA) Lions wait during pre-game ceremonies to play the Bellevue (WA) Wolverines in the Mission Viejo Football Classic in Mission Viejo, California, Saturday, September 3, 2011. Oaks Christian went on to lose 31-21 to Bellevue. 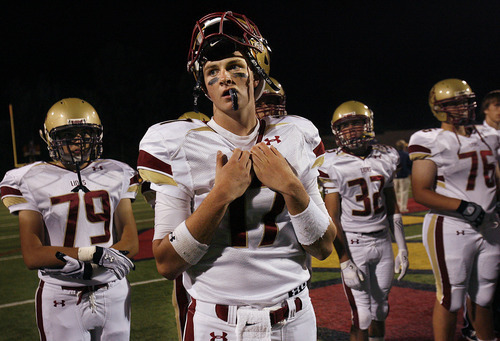 Scott Sommerdorf | The Salt Lake Tribune 6'4", 205 lb Oaks Christian QB Luke Falk during pre-game practice prior to playing against the Bellevue (WA) Wolverines in the Mission Viejo Football Classic in Mission Viejo, California, Saturday, September 3, 2011. Oaks Christian lost 31-21. Scott Sommerdorf | The Salt Lake Tribune Oaks Christian QB Luke Falk passes during pre-game drills prior to a game against the Bellevue (WA) Wolverines in the Mission Viejo Football Classic in Mission Viejo, California, Saturday, September 3, 2011. Oaks Christian lost 31-21. After three games in the spotlight, Luke Falk's California adventure is over. 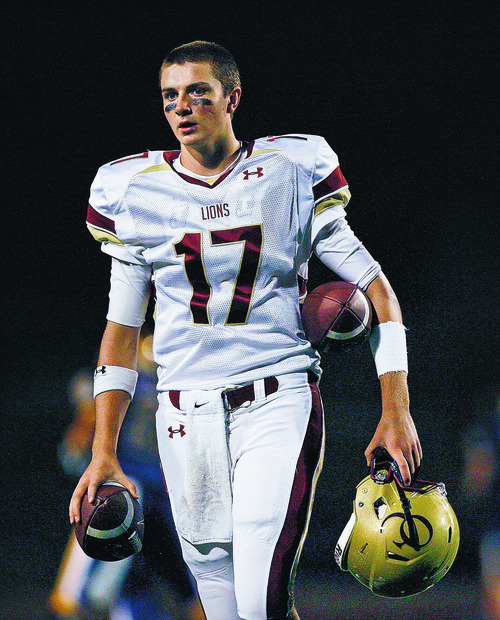 Falk, who has an offer from Florida State, was 1-1 as a starter at Oaks Christian, which produced QBs Jimmy Clausen and Nick Montana, before losing the job last week to sophomore Brandon Dawkins. In starts against Bellevue (Wash.) and Agoura (Calif.), Falk completed 27-of-53 passes for 317 yards. He threw three interceptions against two touchdowns. Falk will return to Logan, where the Grizzlies are 6-0 and ranked No. 1 in 4A behind the sterling efforts of Utah State-committed QB D.J. Nelson, with whom Falk split time last season. "Luke will be able to achieve what Luke wants to achieve from Logan," said Mike Falk, Luke's father. "I didn't know that earlier." The UHSAA's "single season rule" will likely prevent Falk from being eligible to play at Logan for until his senior year. "They've got a great season going now," said Mike Falk, "and if there's something he can do to help that's great, if not he's got another season in front of him." The default reaction is to point to Falk's struggles at the highest level of California football as the impetus for his return to Utah, but Mike Falk said the move had put a great deal of strain on the family. "If there's 30 reasons we moved out here," Mike Falk said, "there were four of them that held true. The expectation and the result. It's been a wakeup call for me." Falk's sisters, Natalee and Alexa, originally moved with the family to their opulent neighborhood of Oak Park, with intentions to further their music careers. They ended up, however, back at Utah State to finish their degrees. Mike Falk operates an international commercial real estate business out of Logan, and said he was flying back to Utah twice a week. 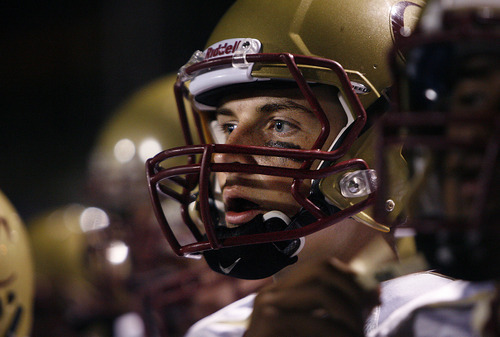 Luke Falk at Oaks Christian never seemed quite like a concrete match. Multiple times after moving to Southern California, the 16-year-old waffled on his decision and stated a desire to return to Logan. In a Sept. 4 interview for the in-depth Tribune story referenced above, Falk said he found himself wanting to return to Logan. "It was kind of the missing home," he said at the time. "But then my dad kind of kicked me in the rear, 'What are you doing?'" 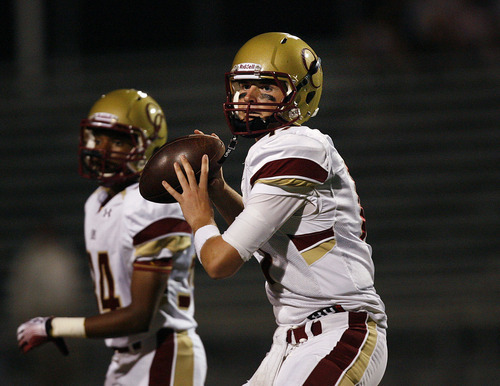 Oaks Christian coach Bill Redell said he still sees Falk as a Division 1 quarterback, even though he made the decision last week to start Dawkins, instead. "It was 1A, 1B," Redell said, "with Luke being 1A, but after the last game he went to 1B. He would have played for us, he would have played a lot for us. He may have won back the starting job later in the season." The Falks had answered questions since first moving in December about the lengths wealthy parents will go to in pursuit of success for their kids. They were featured on a CNN special entitled "Extreme Parenting." By Monday, Mike Falk said the move was a mistake. "If anyone faces a similar situation, a similar decision, I would not discourage them from doing it," he said. "I would not encourage them to do it. But what I would do is offer anybody that wants to call me, I would be glad to share with them the reality of what they would be facing."